Hmmm. I'm of two minds on this book. On the one hand, it presents something I wish there was more of: in-depth studies of individual video games, rather than the grand sweeping theories that pervade most game studies books; in general, the game equivalent of close reading could really use more attention in the field. And it's written by a scholar with a well-established pedigree in game studies; between the Game Theory Readers, The Medium of the Video Game, and the Videogame Explosion no one can deny that Wolfe doesn't know his stuff. 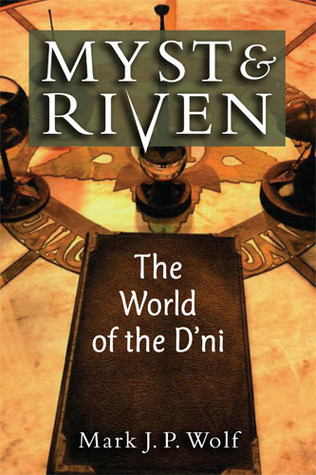 And sure enough, the book is well-written and almost encyclopedic in its knowledge of Myst and Riven, going through the development and play of both games in great detail. And then there's the "but." But, the book is very slight. At 111 pages, I read it in two sittings. And of those 111 pages, there is arguably not a lot there. Interpreted in the most unfriendly way possible, it's a glorified walkthrough, describing in painstaking detail the step-by-step process of progressing through the games (and on that note, there is noticeably more focus on Myst than Riven, so if it's a walkthrough, it's an incomplete one). It's not that there isn't more to be said on the games; it is, after all, one of the more recognized games in game studies, and a brief section outlining some of that scholarship (Bolter and Grusin's assessment of it, for example) would have been welcome. In a related issue, my biggest problem with the book is that it doesn't seem to have a clear focus. There's no real argument present here, no thesis that Wolfe is presenting to either advance video game scholarship at large or to just guide our reading. Some of the points Wolfe raises concerning puzzle construction and spatial exploration (especially the early description of game world) hint at larger ideas on game design, but it's largely left to the reader to tease these meanings out. To counter the negative interpretation earlier, interpreted in the most generous light possible, this drift is not a failing. Rather, it could be argued that the book is written in the tone the games themselves inspired: a quiet, even somber journey that promotes contemplation and reflection over something showy and ostentatious. But then again, even the games had actual goals.